LRT to Rain Destruction on Apricot Trees? A proposed Eglinton West LRT entrance may carve out up to 900 square feet of a local park. Apricot trees in blossom at Ben Nobleman orchard. Photo courtesy of Susan Poizner. 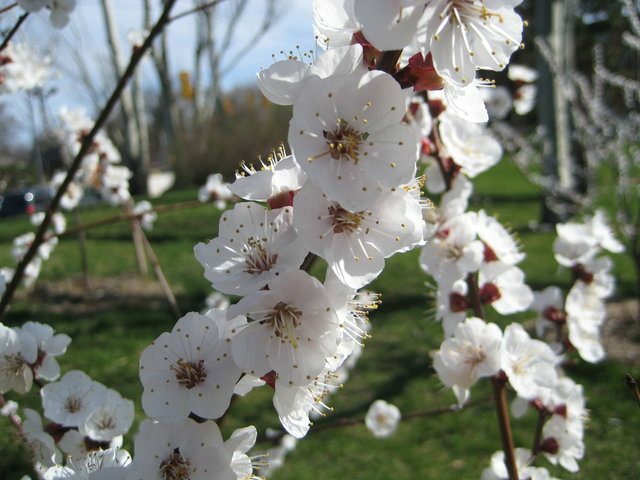 The Ben Nobleman Park Community Orchard will have its first ever crop of plums and cherries this year, but a proposed entrance for the forthcoming TTC Eglinton West LRT may soon thin the harvest. Susan Poizner, a 10-year resident of the Eglinton West area, used to see Ben Nobleman Park as an empty, underused space distinguished only by a shoddy playground and overgrown perennial beds. She decided to bring the space to life by co-founding a community orchard in 2009. Nine trees were planted, including cherries, plums, and pears. The following year, three apricot and two apple trees joined the bunch. Now over 20 volunteers care for the trees and carry out organic-fruit-tree-care workshops (last year 98 people were trained). Full harvests are expected in 5-10 years, and Poizner expects that the bounty will be divvied up between volunteers and the food bank, and distributed at community events. And yet, a proposed secondary southern entrance to the new Eglinton West LRT station may cause three to six orchard trees to be lost, as well as a number of mature evergreen trees. The station will be part of a new crosstown 25-kilometre rapid transit line that is scheduled for completion in 2020. 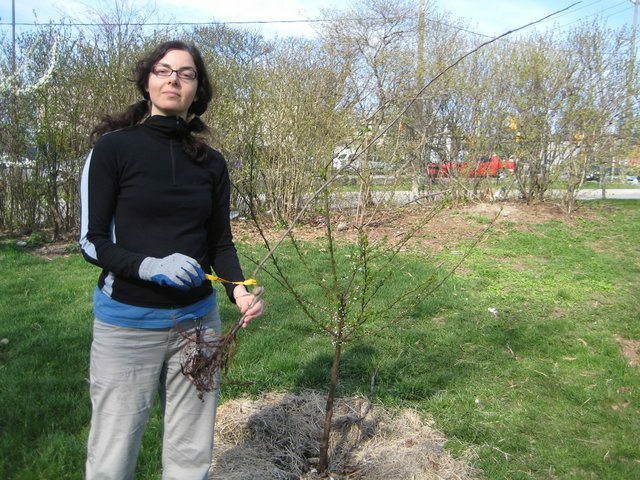 Susan Poizner tends to one of the newly planted orchard trees. While the main entrance will be located on the north side of Eglinton, several residents (who live across the road) have indicated that they want a southern station entrance too. Most suggested at a February 2 open house that this entrance be located within Ben Nobleman Park, though others did suggest carving out part of the nearby Division 13 police station parking lot. No clear community consensus has emerged and the TTC is now conducting a survey that presents four options for the entrance location, most of which carve out approximately 900 square feet of the park. According to Franca Di Giovanni, TTC community liaison officer for the Eglinton Crosstown project, the police have made their wishes clear–they wish to lose neither their parking spaces nor access from Eglinton Avenue. For Poizner, a park entrance would mean not only the loss of precious fruit trees, but also a haven that unites the mixed residential and commercial community. “Once you lose your green space, it never comes back,” she cautioned.